I suppose 2016 will be remembered as the year in which the camera drone revolutionized the presentation of real estate. The yew (?) in front of the house has been allowed to take a major place in the appearance of the house. I like it. The problem now is to keep it from swallowing the house altogether . . . ? In 2012 the planter contained a Japanese maple -- I think. Is it possible that Penfield is the only CMU Usonian in which the vertical joints have been completely obliterated ? Wouldn't you like to know whether that was Wright's specification for this opus, or if it was the work of an especially enthusiastic apprentice -- or owner ? I would . . . In the Companion Storrer tells us that Wright's "standard 13-inch Usonian vertical unit" had to be "modified to achieve 8 foot bedroom ceilings" -- after the client informed Mr Wright of his 6-foot 8-inch height. Would Wright really confound a 13-inch unit with an eight-inch-high block coursing ? A quick search for Sweeton brought me to this restoration photo. Doesn't this also qualify as obliteration of the vertical? Hmm. Why yes, that is a pretty good second. How could I forget ? So -- that's two. Any more ? The standard cmu block had the verticals filled, but the custom block houses typically had no visible mortar joints, with both eased vertical and horizontal edges, right? You mean, the Automatics ? I guess that's a more honest use of block -- but the streamlined effect of Penfield and Sweeton seems to fulfill Wright's true desire, somehow . . .
Maybe you mean that the mason took it more seriously in some cases? Yes. Standard running bond masonry is arguably knitted together in a way that stacked bond can't equal -- though the steel weave of the Automatic has them both beat, potentially. With filled vertical joints, the texture of running bond is replaced by something idealized beyond any "honest" exposed masonry. Yet the simple step of filling those joints doesn't really alter the structure; it just streamlines it in a simple and straightforward way ? The crucial difference between most of the block Usonians, and Penfield and Sweeton, is the paint: in the others the filled joints are still visible, as the mortar will always be of a different texture from the block, even if the color is closely matched. With paint, and perfectly flush pointing, the joints can -- and do -- really disappear. And -- we could argue that painting masonry really does cross a line between "honest" use of material, and ''dishonorable" -- couldn't we ? Yet there it is; Sweeton is delightful, as is Penfield. It remains to hear whether Wright intended the paint; if so, we are taught a lesson about the use of material, and if not the result is nevertheless so convincing as to make a mockery of the "rule." 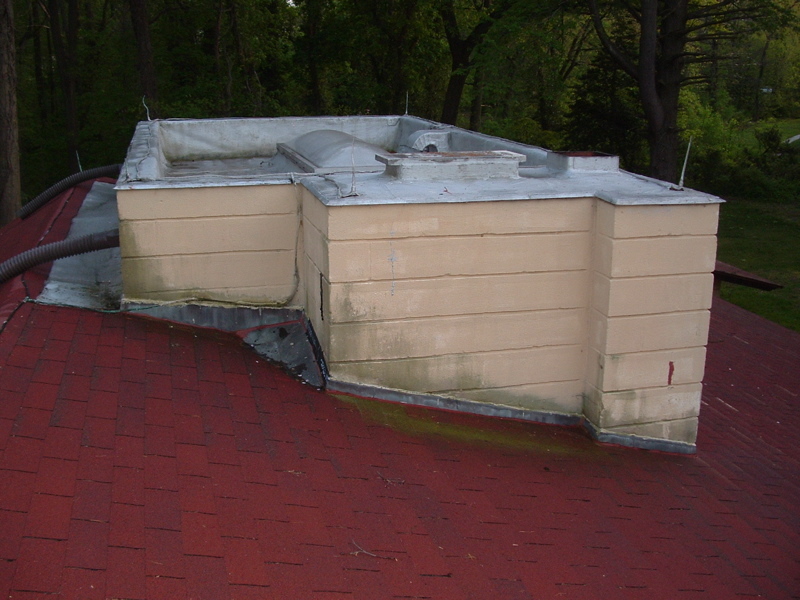 In the Sweeton correspondence, it was noted the Bondex paint Wright specified was to minimize water absorption by the block. It may be significant that Sweeton, Bachman-Wilson, and Penfield are all sited near wetlands. Aesthetically, from the three construction pictures I have, it was apparent standard concrete block had significant variances in tone...to hold the mason to consistency in tone on such a utilitarian material used on a modest house would likely have inflated the masonry budget beyond reason. The necessity of grinding the bed joints to achieve the shadow line likely played a part in the decision to paint the block as well. Davy Davison stressed in a letter that Wright cautioned against "applying the paint too thick, such that the block texture is lost". The bed joints were ground after hardening, not raked while wet? Say it isn't so . . . ! Though raking while fresh would likely disturb the ends of the verticals ? 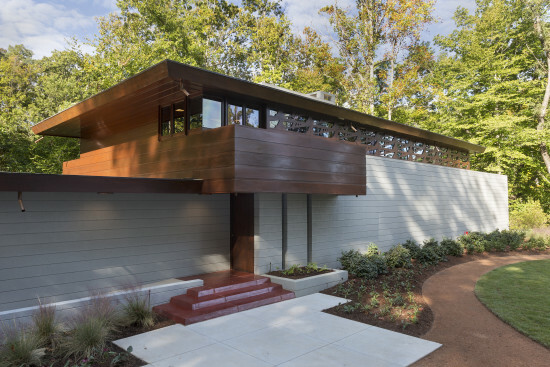 To reduce costs, Sweeton house was constructed with supervision by Taliesin via mail, telegram, and telephone. Davy Davision made one visit during construction. According to payment records, the Sweetons paid for his air and bus fare. During his visit, Davy noted that the mason had struck the block head joints flush, but bed joints were tooled with a standard concave tool. Davy directed the mason to grind out the bed joints at all exterior locations above grade and interiors, but that grinding was optional at the kitchen, bath, tool closet, and workshop interiors, and surfaces to be covered with trim, shelves, or furniture per the plan. The mason paid the Sweeton's son Richard, home from Duke for the summer, to assist in the effort, and according to his sister, Richard did most of it. In the master bedroom and dining area there are locations where grinding stops mid-wall quietly indicating the locations of the long gone furniture. That's cool, It's such a beautiful house full of history. I'd love to go inside.